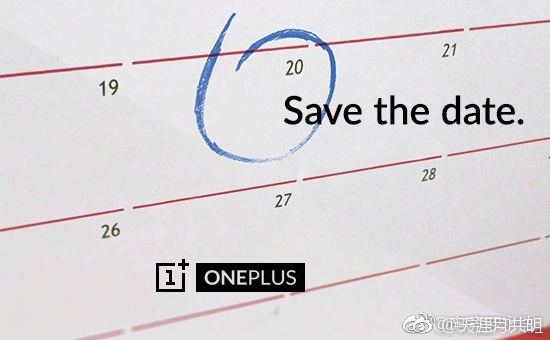 A new OnePlus 5-related teaser surfaced on Weibo, this time showing a calendar with the number 20 circled and the "Save the date" tagline next to it. These being said, we should get ready for the arrival of the new OnePlus handset. Those who are still waiting for a flagship worthy of their attention might enjoy the upcoming OnePlus 5. Even if it does not turn out to be their thing, at least they would have one extra option to consider. Now, it looks like the arrival of this new handset is scheduled for June 20. This piece of news comes via a promo image that surfaced on Weibo and was picked up by DroidHolic. The image does not show the handset itself or any technical specs, only revealing a calendar with the number 20 circled and a tagline that says it all - "Save the date." Sadly, the image does not arrive from OnePlus so it might not be what the company has in mind. The rumors concerning the specs of the upcoming handset mentioned 6 GB RAM and 128 GB internal storage, as well as a top-of-the-line variant with 8 GB RAM and 256 GB internal storage that would hit the market some time after the first model. A dual camera setup is also in the cards. We will probably hear more rumors on the upcoming OnePlus flagship in the coming weeks, so stay tuned.